Last year, Beelineweb decided to try something radical at its workplace. Instead of sticking to the usual 9-to-5, five-day workweek, it decided to make the shift to four days. The online marketing services company based in Lake Country, B.C., was looking to improve the health and wellness of employees by providing better work-life balance, according to Amy Gaglardi, Beelineweb’s director of business development. 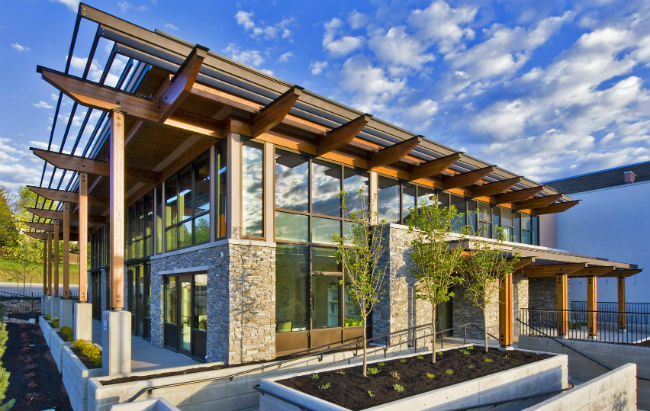 The small company also has a big environmental focus, having built its office using rapidly renewable resources, reused materials and geothermal heating and cooling, said Gaglardi. The change also appeals to different demographics, she said. Beelineweb has always focused on a healthy workplace, with perks that include an office gym, fitness breaks and organic fruit delivery. It also recently switched to offering a set amount of personal days instead of sick days so employees could use the extra time to engage in healthy activities if they so desired, said Gaglardi. And in making the change to a four-day workweek, employees’ workload, vacation time, benefits and salaries were not impacted, she said. The change from five to four days had a few hiccups before it ran smoothly. For one, while staff were happy with the extra day of leisure, some of Beelineweb’s goals and bigger projects weren’t progressing as hoped, said Gaglardi. His father, Stephen Covey, wrote The 7 Habits of Highly Effective People. “This course helps us focus on prioritizing scheduling and the big things — staying focused, not letting perceived urgency pull us off track — and it also touches on fuelling one’s fire, increasing energy, how to think more clearly, how to feel more accomplished on a daily basis,” said Gaglardi. The course focuses on four different quadrants of time: important and urgent; important and not urgent; not important and urgent; and not important and not urgent. “Where you really want to be spending your time is in the ‘important (and) not urgent’ quadrant, that’s where you’re really getting things done and making big changes,” she said. The results of the shorter workweek have made all the effort worthwhile, said Gaglardi. Business clients have also been receptive to the change, knowing the office is now closed Fridays. “Our clients have been extremely supportive. We haven’t had any negative feedback at all,” said Gaglardi. The perk of a four-day workweek should also help with attraction and retention. “It’s benefited our company and people’s attitudes and productivity in such a positive way that I would really hope that other companies would kind of follow suit and try and make it work,” she said. Amazon is one of the more prolific employers offering a 30-hour workweek to some employees, but others have included a firm in New Zealand and retirement homes in Sweden. For employers making such a move in Canada, it would be welcomed, according to a 2018 survey by Angus Reid. Close to half of Canadians (47 per cent) said that moving to a 30-hour workweek from 40 hours is a good idea. And 68 per cent said if they have to work 40 hours, they would prefer to condense it into four 10-hour shifts rather than five eight-hour segments. “Whether or not that will ever translate to implementation on a large scale, it’s hard to say but … with increasing automation and less of the physical burden in a lot of jobs, it really does appear that this is something that is going to gain steam,” he said. If shorter workweeks are implemented, “it would certainly not be in a uniform capacity across the economy, but in different sectors where the companies are able to absorb some of the cost of experimentation, if you will, and really see if they’re getting the right productivity,” said Korzinksi. Recent research has shown that improved mental health can have an impact on physical health, said Korzinski. However, there are also a lot of people who like to work outside of their regular hours, checking email or responding to work calls, he said. Plus, many companies are concerned about meeting deadlines and production quotas, where their whole structure is built on a 40-hour workweek, he said. Another obstacle would be if employers slash pay as they cut workdays, said Korzinski. A 2018 survey by Kronos also found one-third (34 per cent) of global workers (including 304 in Canada) would consider four days their ideal workweek, compared to 28 per cent who are content with five days. Canadians (59 per cent) are the most enthused about a four-day workweek, compared to Australia (47 per cent) and the United States (40 per cent). And 35 per cent of global workers would even take a 20 per cent pay cut to work one day less per week, found Kronos. “That’s a pretty big chunk, and I think what that points to is that people in general are feeling a lot of stress related to the work life. People have elder-care issues. They have child-care issues; they just want to spend more time doing things that they find rewarding or enjoyable outside of work,” said Joyce Maroney, executive director of the Workforce Institute at Kronos in Salem, Mass. But workers could be more motivated to increase their personal productivity when they have less time, she said. Correspondingly, employers must self-reflect, said Maroney. It’s up to managers and senior leaders to check in — frequently — on efficiencies, she said. Nearly nine in 10 employees (86 per cent) said they lose time each day on work-specific tasks unrelated to their core job, while 40 per cent said they lose at least an hour on administrative tasks that do not drive value to the organization, according to the Kronos survey. “Especially in our current climate, where unemployment is at historically low levels, I think employers need to take these kinds of insights very seriously. Not necessarily that everybody should get a four-day workweek — because that’s not practical at every organization — but to really look at ‘What can we do to give our employees the flexibility that they need to have the balance they need between work and everything else that they’re responsible for?’” said Maroney.